Let's Appreciate My Vet [D7093] - $6.00 : Yarn Tree, Your wholesale source for cross stitch supplies. Cross stitch chart from Imaginating. Designed by Ursula Michael. Do you have a great vet? This design would be perfect to stitch them for their office! This design features a big paw print with sayings stitched in the middle. 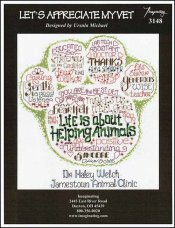 Some of the sayings are, "Life is about helping animals," "you are the best vet," etc. The name of the doctor & office can be stitched below the design. Stitch count 151 x 161. Stitched on #2936 Zweigart Aida 14ct. White.